YOUR AWESOME PARTY STARTS NOW! Thinking about bringing your party and celebration to AIRZONE? Great! Looking for something different and truly unique? AIRZONE is your answer! 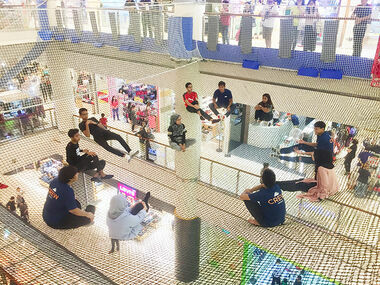 AIRZONE can accommodate up to 50 pax at a time. All you need to do is work out who you want to invite? Have you heard? AIRZONE can hold up to 50 people at once! Maximise the fun times in AIRZONE when you come with your friends! Looking for a venue to hold an unforgettable event?Look no further! AIRZONE is a venue with a totally different perspective. Climb to new heights and explore all the fun and enjoyment of 3 levels. Exclusive venue hire and non-exclusive booking are available.